This article focuses on Print Design: Which Software to Use and When. When designing for print there are a number of pieces of software available to help. The three main programmes used by designers all belong to the Adobe design suite; Adobe Photoshop, Adobe Illustrator and Adobe InDesign. Photoshop, Illustrator and InDesign offer different design features and functionality. Each programme is designed to be used for certain aspects of print design. Understanding the difference between each and when to you use them will help make your print design easier. Photoshop is one of the programmes within the Adobe design suite. It is probably the most widely known programme among non-designers. Photoshop is used to create high quality artwork for print. One of the main features of Photoshop is the ability to manipulate and edit images. Photoshop is the best programme for creating and editing images and photographs. Photoshop has a range of tools and features that help with creating high quality artwork ready for print. Once your designer has created your images in Photoshop, these high res images can then be used across your print marketing campaigns from posters to brochures and everything in between. It is worth mentioning that you should avoid creating logos or setting text in Photoshop as it is not the best software programme for the job and Illustrator and InDesign will do a much better job of these. Illustrator also belongs to the Adobe design suite and is used to create high res vector logos, that will replicate themselves at any size. Meaning you can scale up or scale down your logo and it will remain in proportion and will not pixelate during print. Although great for creating vector logos Illustrator has many other great uses, such as designing and editing illustrations, shapes or graphics. Illustrator creates images in vector form to ensure that the image will remain clear – no matter which size it is scaled to. Designing in vector is great for print design as it enables your graphic designer to design once and use the same artwork across your print marketing campaigns including business cards, posters, billboards and direct mailers. InDesign’s speciality is creating, editing and laying out designs for printed materials such as magazines, brochures, posts and leaflets. Hi-res images that have been created in Photoshop along with the vector images created in Illustrator can be imported to InDesign to design your printed materials. As part of the Adobe design suite, InDesign works perfectly with Photoshop and Illustrator and is used for the laying out of your printed materials. 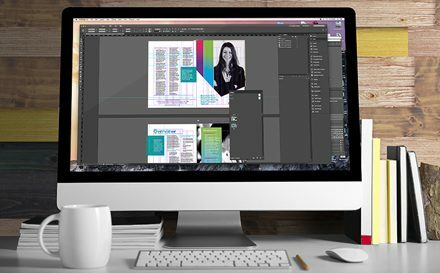 From business cards, brochures, books and posters, InDesign is the go to programme when it comes to print design. It is also great for adding copy to your artwork and it will not pixelate as it would if created in either Photoshop or Illustrator. Quark Xpress: Some designers still use Quark Xpress which is a page layout programme that was particularly popular in the 1990’s. It is a rival to Adobe InDesign and is still used for large catalogues and brochures today. Adobe InDesign has become more popular amongst designers in recent times. This is principally because InDesign is part of the Adobe design suite and works seamlessly with Photoshop and Illustrator. Other reasons are the high cost of Quark Xpress and occasional freezes when using the software. Extensis Suitcase: Many designers use font management software due to the high volume of fonts used on their computers. Sometimes these fonts can clash causing issues so a programme like Suitcase is required. Having a large number of fonts can also slow down your computer so creating sets by client in Suitcase can help.